In Oskar Karlin's interesting time travel map the links on the tube map are proportional to the length of time the train takes, and he's added time contours underneath the map. But recolouring the lines makes the Underground diagram a bit confusing, and arguably the contours tell the story better than the redesigned diagram, whose shape now looks less recognisable for the tube traveller. So a different approach might be to provide a time contour overlay on top of the original diagram - something like this sketch of 10-minute travel time from Oxford Circus station (which takes the intervals from Geoff and Neil's travel times map). What's bad about it is that the contour would become a bit of a mess. However, the contour's shape suggests that some lines (the Victoria in this case) are really useful for punching through the city quickly. Perhaps it also hints that the tube diagram compresses London's geography west of Oxford Circus in particular. But we all have different journeys to make, so ideally the time contours element would be dynamic: allow the user to centre it on an station and generate their own time contour overlay in the place of the price zones. There are two more variables that could be usefully added to such a map: the average wait time for a train (which we can get from TfL Journey Planner's real-time timetables), and the interchange time - the time spent walking the underground passageways when changing from one line to another. If you change from the Jubilee line to the Bakerloo at Baker Street it's a speedy 30 metres. But changing from the Jubilee to the Piccadilly at Green Park is much slower - the mosaic on the wall gradually changes colour from Jubilee grey to Piccadilly blue, and travellers can often be seen breaking out rations and tents at the halfway mark. Is it worth going further with time and contours? Only if adding real-time traffic conditions and street maps into the mix, or hooking it into satellite/street map services (and dealing with the challenge of switching between geographic and symbolic representations), or making it work on your mobile, etc results in something useful for the user. Perhaps it would be more helpful to show exceptions and changes: when the tube is suffering delays or line closures, show updated contours and alternate routes. 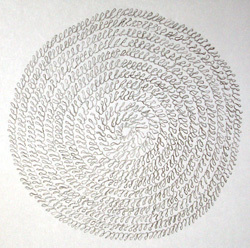 Looping circle and spiral, both pencil, c.11cm in diameter on two sheets of A3, 1 Dec 2005. 1. 12 concentric circles of 777 loops. Afterwards, kneading a sore hand and elbow, a thought: would the number of loops follow a progression - say, Fibonacci - from one circle to the next? Perhaps not: 12, 16, 29, 41, 55, 66, 82, 91, 98, 114, 127, 144. 2. A spiral of wobbly loops. No idea how many loops. And a couple of warm-ups. See also: Fully Articulated (2002-3), similar attempts to sustain a regular pattern with the eye and hand, eg dotting the largest circular disc possible in an hour.